Last time we asked: What other sorts of details can we find on thimbles? Well the most obvious thing about thimbles, other than the basic shape, is the dimples. They come in a moderately extensive selection of sizes and shapes, although the most common shape is “sort of round”. Now that may sound a bit vague, but you need to realize that the shape and size of the dimples is dependent on three things: the shape of the punch used to make the dimple, the amount of force used to hammer the punch, and the softness of the metal that the thimble form is made of. As a punch is used over and over it may deform to “less than round” or it may never have been completely round in the first place. Here is a picture showing some examples of the variations in size and shape of dimples that I have in my own thimble collection. From left to right we have: “sort of round” that is placed so closely that there is almost no space between dimples, chisel lines that are placed in relatively neat lines, random small dimples, small dimples that are applied in sections to create a pattern, and triangular dimples that progress in a spiral around the thimble. We can also look at the top of these thimbles to see how the dimples are arranged. This picture shows exactly the same thimbles in the same order across the page. They all have a spiraled top, except for the “random” pattern thimble, which continues to be random on the top, and the shaped patterned thimble, which is tonsured and has a hole. Over time the complexity of the European thimble form increased. The ridge at the bottom of the thimble, which was an occasional accidental result of the manufacturing process in early thimbles, became a purposeful feature. A decorative band also began to be added, and especially in silver thimbles, this area was often elaborately engraved. At the very end of the 1500’s the bottom ridge became a location for maker’s marks, and this tradition has continued into the modern era. Entire books have been written about the various makers of thimbles and where they were from. The main source of thimbles in Europe was Germany. This was due largely to a readily available source of bronze. By 1373 Nuremberg had become the center of this thimble production and there were large numbers of workshops in the city. They developed a specialized form of metal called latten, which was an alloy of copper and calamine, and was very easy to form. In some countries the guild systems had separate guilds for thimble makers who worked in latten, and those who worked with other metals. There are several pictures demonstrating the production of thimbles in Germany. 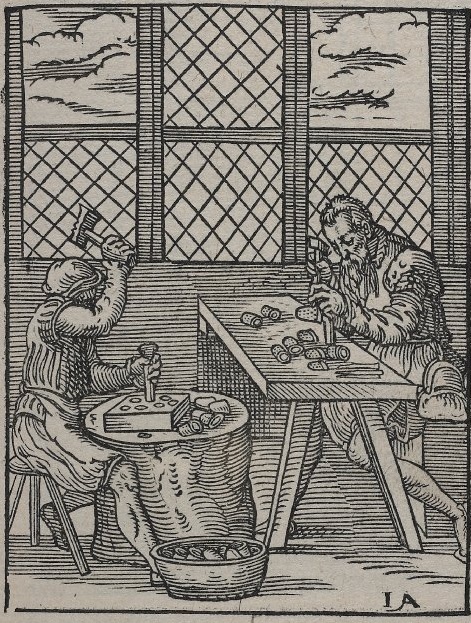 This woodcut is from a book of trades that was printed in 1568 in Frankfurt, Germany (owned by the British Museum). Next Time: How can we tell a pre-1600’s thimble from a later thimble? This entry was posted in Metal Casting, Metal Working, SCA Life, Thimbles and tagged bronze thimbles, European thimbles, German thimbles, Historical thimbles, Medieval German thimbles, Medieval Thimbles, thimble making, Thimbles by Eirny. Bookmark the permalink.